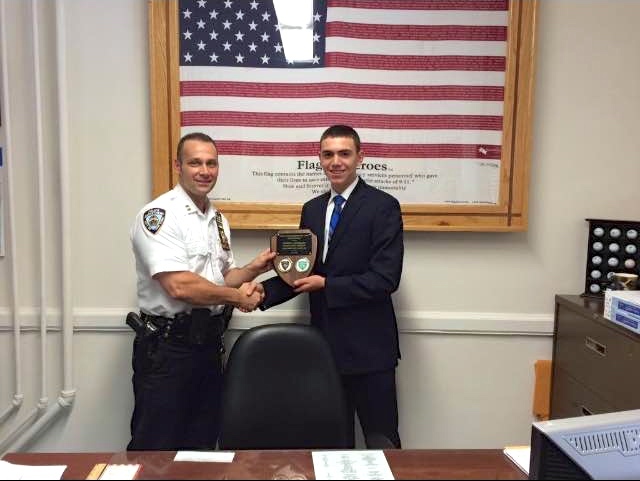 Cathedral Junior Anthony Santagata, ’16, was sworn in today as New York City Police Commissioner for a Day. A.J. 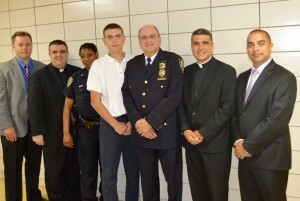 won an annual essay competition organized by the Police Athletic League and sponsored by our local police precinct. Also, while at police headquarters today, Fr. 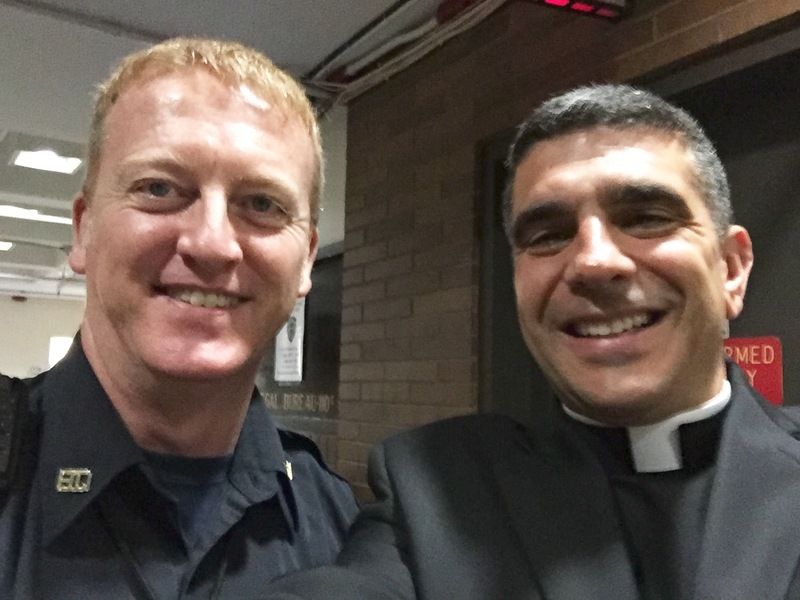 Joseph Fonti, Rector-President, ’84, ran into his Cathedral Prep school mate, Mike Noone, ’85. Mike works security at One Police Plaza and has been a police officer for 19 years. Fr. Joseph Fonti, ’84, Rector – President, celebrated Mass with the school community as well as with the parents and family members of the Junior Class, ’16. Fr. Kuroly, ’98, Fr. Rodriguez, and Fr. Kevin Sweeney, ’88, concelebrated. Transitional Deacon Chris Bethge, ’07, assisted at the Mass and offered an outstanding homily. 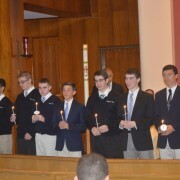 18 juniors were inducted into the National Honor Society. Timothy Sullivan, ’16 and Alexander Matuszewski, ’16, were announced as the new student body president and vice president. The juniors then enjoyed refreshments with their families and enjoyed a day of recreation. 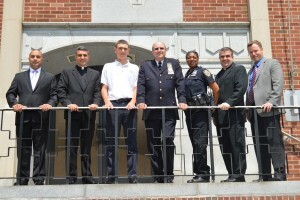 On Friday, May 29, 2015, at the St. James Cathedral Basilica in Brooklyn, NY, Most Reverend Nicholas DiMarzio, D.D., Bishop of Brooklyn, Presided over the Commencement Exercises for Cathedral Prep Class of 2015. Daniel’s comments were followed by the granting of Diplomas and awarding of Honors by Mr. Richie Diaz, ’96, Principal. The keynote address to the graduates was delivered by Mr. Rocco Papandrea, Senior Vice-President-Wealth Management, Merrill Lynch and Cathedral Prep Board of Trustees Member. The Valedictory Address was given by Brian McCormack. ’15, telling stories and memories of classroom lessons experienced with each faculty member, and events outside the classroom that helped shape the Cathedral experience, adding, “thanks to all our Cathedral Prep teachers and coaches.” He spoke of the retreats, highlighting, “…. the intimacy we had with God during the periods of spiritual reflection. We had to be open in order to ask God “what is it that you want me to do?” because the reality is that we may not always like His answer. But that’s where faith comes in. We must have faith in His plan and the willingness to be guided by it. This is what our formation at Cathedral has prepared us to do – to live out God’s will, relying on the faith and trust that has been instilled within us.” After Brian’s comments, Bishop Nicholas DiMarzio gave the closing remarks. The evening was concluded by the singing of the Salve Regina. Cathedral Prep is proud to announce that the thirty-five members of the Class of 2015 earned a total of eight million one hundred and seventy-two thousand ninety-two dollars in total scholarship money. Cathedral Prep is extremely proud of these thirty-five men and their hard work over four years. In total these thirty-five young men earned one hundred and ninety-four scholarship and award offers, and we are proud to announce that 100 percent of the graduating class will be attending college, university, or professional study next year. Awarded to the top three academically ranked students of the Class of 2015. 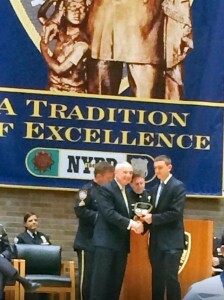 The Bronze Medal is presented to a young men who has earned an overall GPA after four years of study of 96.34, ranking him third in the class. The Bronze medal is presented to Nicholas John Candela. The Silver Award is presented to a young man who has earned an overall GPA after four years of study of 96.60, ranking him second in the class. The Silver medal is presented to Tyler James Flannery. The Gold Medal is presented to a young man who has earned an overall GPA after four years of study of 96.67, ranking him first in the class. The Gold medal is presented to Tomasz Arturo Portela. Awarded to students excelling in academic subjects during their four years of study at Cathedral Prep. 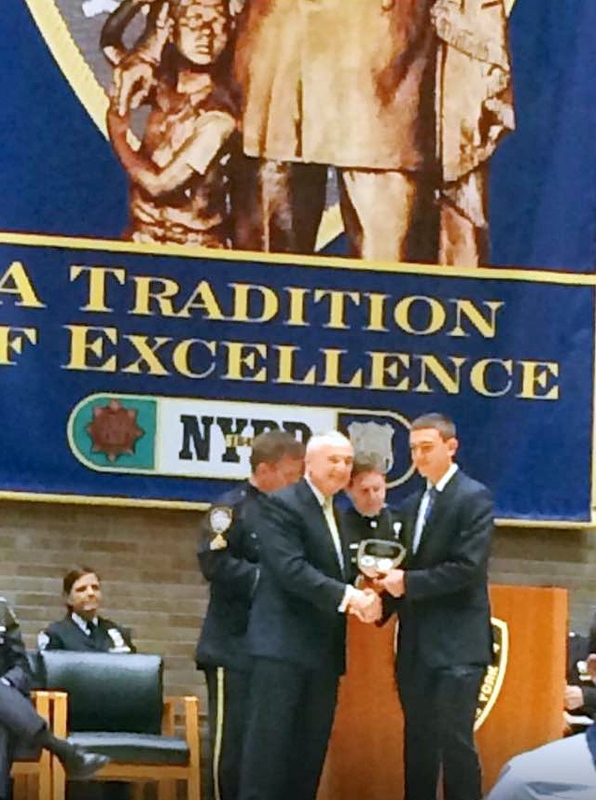 English Award is presented to Anthony Francis Leo Coccaro. Latin Award is presented to James Thai. Mathematics Award is presented to Kevin Torres. Modern Language Award is presented to Mark Anthony Boodram. Science Award is presented to Andrew P. Mercaldi. Social Science Award is presented to Tyler James Flannery. Theology Award is presented to Nicholas John Candela. 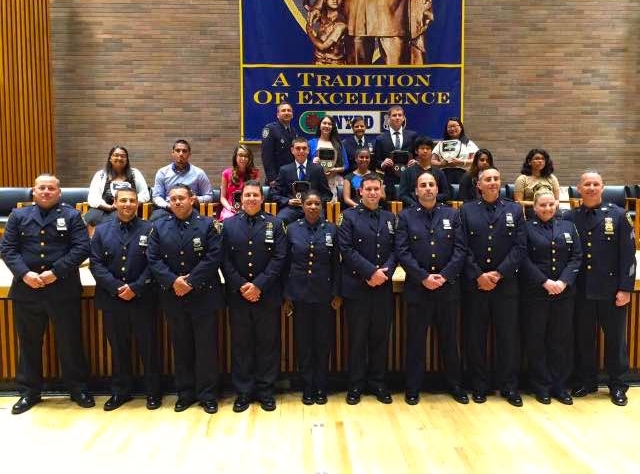 We are proud to announce that every graduate of the Class of 2015 was awarded a New York State Regents Diploma. 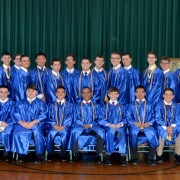 An Advanced Regents Diploma was awarded to those students who have successfully passed the Regents examinations in English, Global Studies, U.S. History, and all required sequences in Science and Mathematics. The following students were recognized: Nicholas John Candela, Anthony Francis Leo Coccaro, Tyler James Flannery, Tomasz Arturo Portela, James Thai, and Kevin Torres. Sponsored by our Diocesan Newspaper, the team is composed of students who exemplify not only academic excellence, but more importantly, Christian Leadership involvement, and responsibility. Given in recognition of outstanding dedication and unwavering effort to scholastic achievement and personal growth. 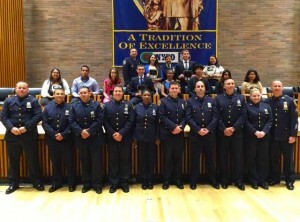 Given in recognition of outstanding school service, personality, and interaction with others. Given in recognition of outstanding academic improvement, excellence, and perseverance. Given in recognition of outstanding character, loyalty, and commitment to school and community. 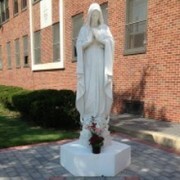 Given in recognition of outstanding protection and outward representation of our school’s core Catholic values. Given in recognition of outstanding dedication to the Lord’s call to individual greatness and His call to always strive for the highest goal. Daniel Arteaga, Maksymilian Bogusz, Mark Anthony Boodram, Nicholas John Candela, Joseph Anthony Capri, Anthony Francis Leo Coccaro, Joseph D. Coverly, Joel Cruz, Daniel DeBaise, Matthew J. Domagala, Kevin Duran, Tyler James Flannery, Miguel Angel Flores, Brendan Francis Gallagher, Michael A. Joyce, Hunter Dineen Lane, Michael Joseph LaPorta, Eric Robert Lesser, Marco Manciameli, Eduardo Martinez, Joseph Anthony Mastrolembo, Brian Daniel McCormack, Sean Matthew McQuail, Andrew P. Mercaldi, Andrew Picon, Tomasz Arturo Portela, Justin Robles, Richard Jose Rodriduez, Thomas Siano, William J. Taddeo, Patrick J. Tatano, James Thai, Kevin Torres, Christian Kenneth West, and Ethan Jared Williams. Cathedral Preparatory School and Seminary is holding its Spring 2015 Blood Drive with the New York Blood Center, scheduled for Friday, May 8, 2015, from 9:15am to 1:45pm in the Gymnasium. Our goal is to donate 40 pints to be processed for the regional hospitals. This blood drive is open to Cathedral’s Parents, Alumni, Faculty, Staff, and Administration. Blood donors must be at least 16 years old, weigh at least 110 pounds, and not have donated blood within the last 56 days. People age 76 and older can donate blood if they meet all criteria and present a physician’s letter. In general, other medical conditions apply. 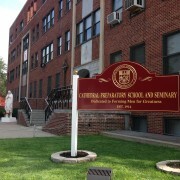 Please note: It is Cathedral Prep’s policy that ALL students 16 and older who pledge to donate must present a signed parental permission form available from school or from the link www.nybloodcenter.org/16 to obtain the form. Please contact Mr. Jeremy Reyes, by either email jreyes@cathedralprep.org or voicemail 718-592-6800 x602, if you have any questions about the blood drive. Students should expect to be dismissed before 12:00PM. All students are expected to be in attendance tomorrow and please note that Report Cards will NOT be mailed to absent students. Cathedral Prep begins Spirit Week! Due to the impending weather and unsafe travel conditions, Cathedral Prep will be CLOSED today, Thursday, March 5, 2015. Thank you for your continued support of Cathedral Prep.